Amarr is among the most well-known garage door manufacturers around thanks to a commitment to quality and style. Among the collections Amarr Garage Doors offers is Classica, which is made up of carriage house steel doors that combine a traditional look with modern features for improved functionality. Classica garage doors provide homes with an authentic carriage house appearance, which can boost their value and improve their curb appeal. These doors offer more than a beautiful appearance, though. They also provide a high degree of safety and low maintenance, making them a great choice for many homeowners in Dallas, Fort Worth, Houston, San Antonio and Austin. The Amarr Classica garage door company has decades of experience crafting residential garage doors with outstanding quality. The Classica collection provides homeowners with a chance to invest in an elegant carriage house garage door that offers energy efficiency, enhanced safety, and other notable features. Amarr has earned a reputation for manufacturing garage doors with exceptional quality, including the entire line of the Classica collection. Homeowners can count on Action Garage Door Repair Specialists to provide them with assistance in selecting a Classica garage door for their home. Classica doors come in a wide range of styles to consider, including ones with closed arches, ones with arched windows and ones with decorative panels. Our experts can easily help you find a Classica product that best fits your home, so you can have a fashionable and highly functional garage door. Whether you choose a solid color or a two-toned combination, your garage will have a stylish and secure door for you and your family to rely on. When it comes to residential garage door styles, Classica offers something for everyone. The Classica collection includes streamlined styles that perfectly suit more modern homes, as well as more decorative styles that are well-suited for homes with a more traditional or vintage appearance. 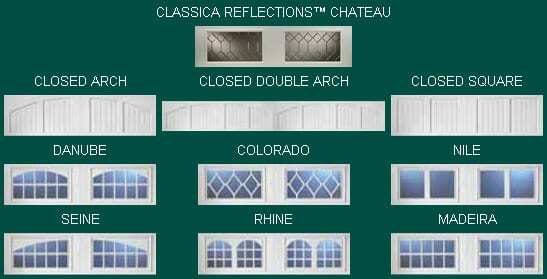 Classica has several door and window designs available, as well as solid colors or two-tone color combinations. With more than 500 colors to choose from, you’re bound to find the ideal colors for your garage door. If you’re feeling overwhelmed, our experts can quickly help you narrow down your design and color options, so you can select the right Classica garage door. In addition to residential garage door styles, Classica doors also offer SafeGuard Pinch Protection for improved safety, larger windows for more natural light and a high R-value for greater energy efficiency. Classica doors also feature wind load doors that are made to withstand strong winds. Contact Action Garage Door Repair Specialists today, so you can get started on finding your Classica garage door. The Classica offers optional factory-installed polystyrene insulation, which provides an extra barrier against inclement weather and noise. All Classica models are available in white only but can be painted with exterior latex paint in a color that is just right for your home. Each Classica garage door comes with heavy-duty hardware, including springs and a track. All parts are galvanized to protect against rust. This garage door requires a lead time of just 5-20 days to order. The Lucern model features a closed double arch top section and optional Blue Ridge handles. Santiago, with a closed arch top section, is accented with optional Blue Ridge handles and strap hinges. The Valencia Classica style has an attractive square top section. The Classica Tuscany features Nile windows and optional Blue Ridge handles. Classica garage doors are specially designed with low maintenance in mind and a low risk of problems. However, despite their durability, these doors can end up with accidental damage or damage caused by wear and tear over time. When you need Classica garage door repair, the team at Action Garage Door Repair Specialists provides prompt and reliable service. Our experts can quickly identify the problem with your Classica door and have it fixed in a timely manner. This allows you to keep using your door safely. Whether your Classica door develops a broken spring or problems with the track, our professionals are ready to come over and make the necessary repairs. Your garage door is a big investment for your home, so it’s important to make sure it’s in excellent condition over the years. Whether your Classica garage door needs repairs for a minor problem or more complex repairs for a more serious issue, our experts can handle it. Have you purchased this product and would like more information on how to operate it? Visit Amarr’s garage doors owner manuals. Contact Action Garage Door Today!